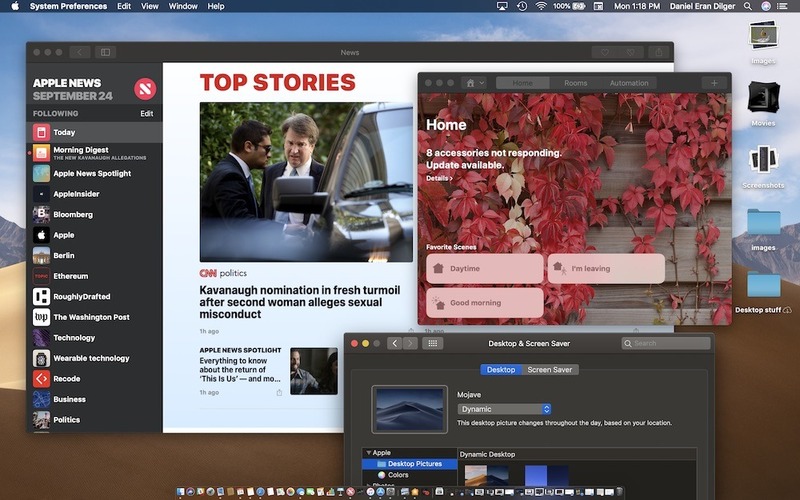 Mojave doesn't radically change the entire user interface of your Mac, but it does give it an optional new Dark Mode appearance and adds a series of thoughtful and useful tools, including better file handling on the desktop with Stacks and in Finder windows with the new Gallery View and Quick Actions. It streamlines simple editing operations right within Quick Look; it enhances password management, security, and privacy; it updates iTunes and radically overhauls the Mac App Store. Plus is also opens the door to running iOS titles on the Mac, starting with a selection of Apple's own apps. All of these enhancements are bundled with a series of bug fixes; improvements and expansions of developer tools; new capabilities for Siri; and features to better support international users. Apple has also outlined its plans for a new multiuser FaceTime in Mojave, although this feature won't ship until an update later this Fall. It's easy to recommend Mojave as an update, but going even further: the new release creates confidence in buying a new Mac, as it paints a picture of competence and incremental advancement that Mac buyers can expect to get every year after they buy their new machine for a solid four or five years —Mojave actually supports some Macs going back eight years. No other PC or netbook vendor similarly offers solid, significant updates for free on an annual basis. In fact, the only other products that are similarly updated are Apple's own iOS devices. Mojave is, quite clearly, the Mac for iOS users who want a computer that is supported as well as their mobile devices. A lot has advanced since the first Public Beta back in June. Dynamic Desktop is now functional, so the included Mojave desktop dune image, and a simpler "solar gradient" color desktop, will now automatically change to give you a sense of the time of day as you work. 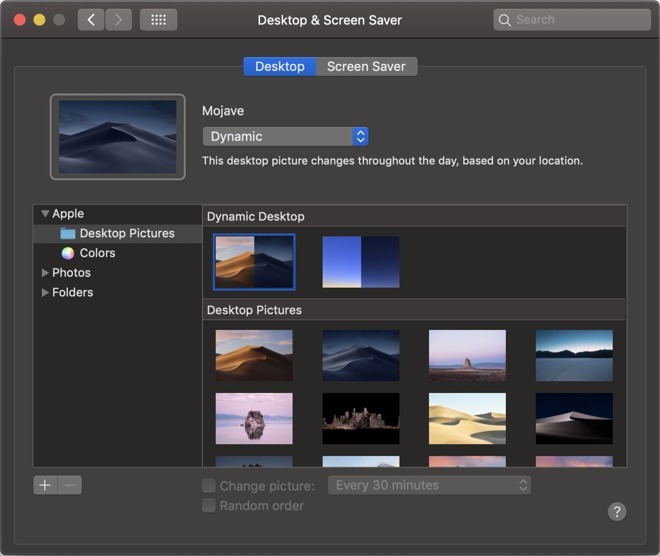 Apple includes seven other desert themed images and a variety of other new and previous desktop images to choose from, but none of these support dynamic time shifting. It will be interesting to see if Apple releases new Dynamic Desktop image packages the same way it incrementally updates Apple TV aerial screensavers. And it will be quite a bit disappointing if this is feature is only limited to the two currently provided. Continuity Camera, one of the features that seemed to be working inconsistently in early betas, now appears to be solid across a variety of apps. Once you place an image taken by your iOS phone or tablet, there's a pull down control on it that lets you crop or edit it on your Mac via Markup (or use other Extensions you've installed). The scan functionality is particularly impressive, as it uses ARKit on your iPhone to intelligently map out the edges of the document. Once you capture it, you can refine the selection of the rectangle's corners, and it will skew the image to straighten it. After you approve, you continue capturing other scans or save what you have directly into your document. In our testing this worked impressively well. After placing images in a document, you can also double click on embedded Continuity Camera shots or scans to open them up in Preview for editing. Speaking of Preview, one oddity we noted in the early Public Beta was the inconsistency in the placement, appearance, and behavior of editing tools between the Markup tools in Preview and those when editing in Quick Look. The tool bars are still arranged differently, with a different default tool selected. In Preview it's the area selector used for cropping. In Quick Look, it's the drawing tool. So if you try to do a quick crop with the mouse the way you would in Preview, you begin drawing on your image instead. There are also some Markup tools missing from the new Quick Look editing mode: Instant Alpha, the Adjust Color panel (with tools for exposure, contrast, saturation, sharpness, etc) and the Image Dimension panel for manually resizing to a set percentage or to a number of pixels or inches. Rather than being an unfinished feature, this issue may simply be an example of two inconsistent implementations of Markup functionality. Over the years, macOS has previously introduced new UI concepts that take some time to consistently spread across the whole OS. Examples of this are becoming less frequent and thus stand out as more obvious when they do occur. Another inconsistency we noticed in the beta that hasn't changed relates to Stacks. 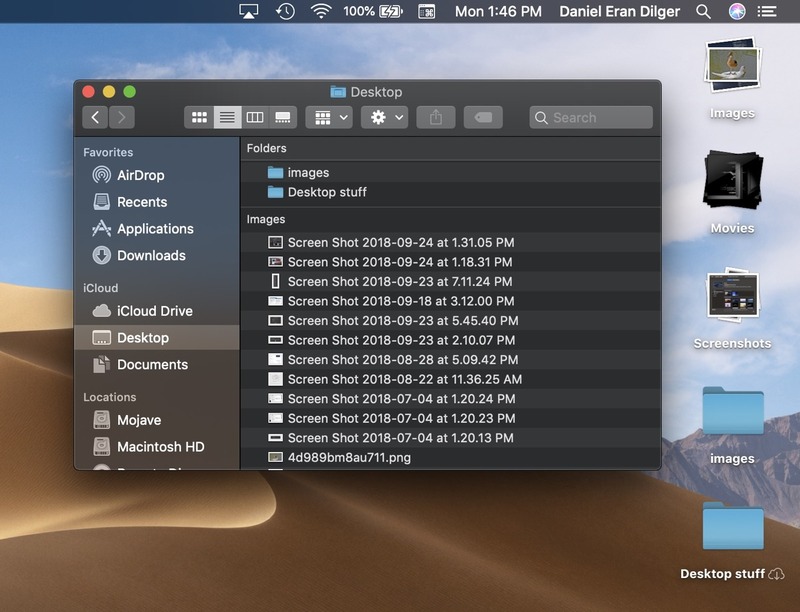 This feature only exists on the desktop: if you open a Finder window and look at the "Desktop" folder, you still see each icon separated instead of stacked in groups by type. However, even when you Group documents in the Desktop folder by Kind and use Stacks on the Finder desktop to Group by Kind, you get different results. For example, in Finder windows all images are sorted into a single group, while on the desktop, Stacks separates Screenshots from other standard Images. When grouping by kind, Stacks separates screenshots from images. Finder windows don't. These are not showstopper problems, but do make the Mojave experience a bit confusing, forcing you to think about what "mode" you're working in. That's something the Mac human user interface guidelines have always sought to avoid. On the other hand, the Mojave Finder's new Preview Column, shown by default in the new Gallery View, presents a set of Quick Actions (implemented as Finder Extensions) which includes the exact same Markup functionality that appears in Quick Look. So Preview itself is the odd app here. 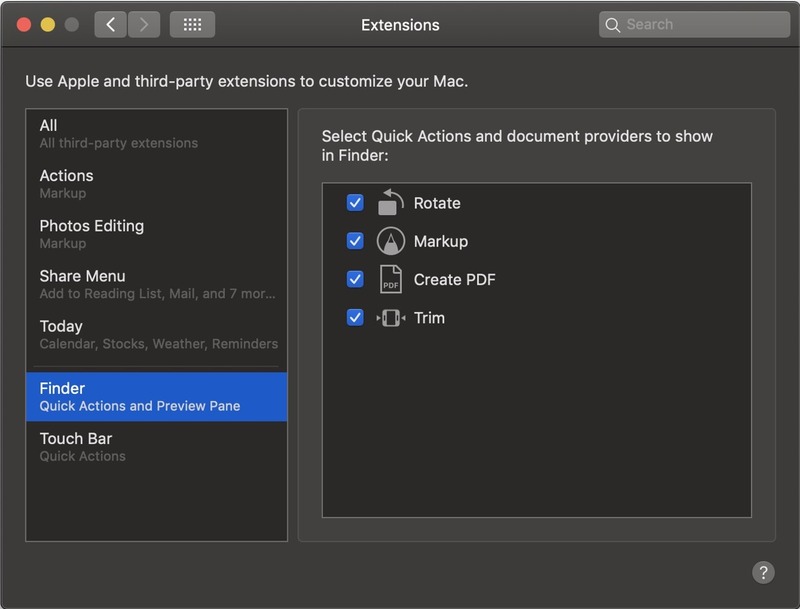 In addition to Markup, Apple also provides Finder Quick Actions to Rotate an image; Create a PDF from image files or Trim an audio or video file. These features bring iOS-like, app-free editing of documents to the Mac, creating a new consistency across Apple's platforms. Note that this implementation has also been cleaned up since the first public beta. The Preview Column in Gallery View is also customizable, so you can configure how much metadata you want to see. Simply open up Show Preview Options from the Finder's View menu (below). Another aspect of Mojave to see big beta-period improvements are the new UIKit-based apps from iOS: Home, Stocks, News and Voice Memos. In the beta, these felt like really fresh ports ripped from iOS. Now they feel and look like native Mac apps. 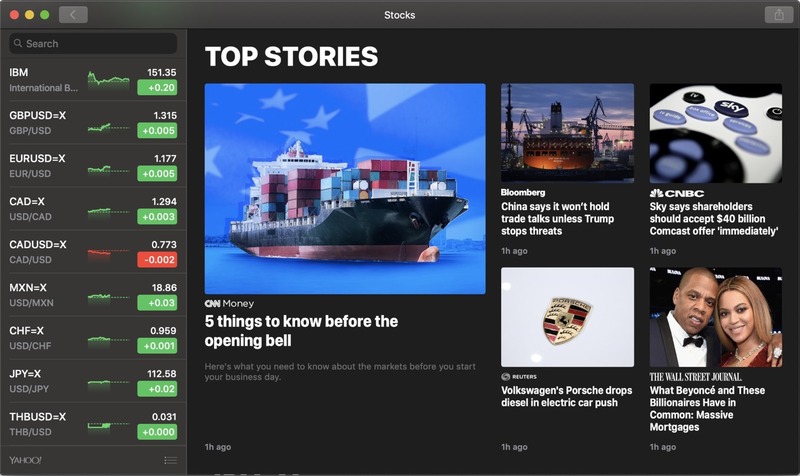 News and Stocks are actually a nicer experience on the larger Mac display with a sidebar rather than an iOS Maps-style slide up panel for navigation. Voice Memos now sync to iOS via iCloud, and Home now correctly references "double clicking" to configure a HomeKit accessory, a behavior that doesn't exist on iOS. This should create confidence in Apple's stated plans to further refine and open up UIKit support on Macs for third party developers next summer, creating a wave of new apps and utilities for Apple's approximately 100 million Mac users originating from the massive existing library of apps created for the billion users of iOS. While pundits once imagined Apple would create a Red Box to run PC software on Macs natively, it's now working to leverage the massive popularity of iOS to improve the range of titles available to the Mac. 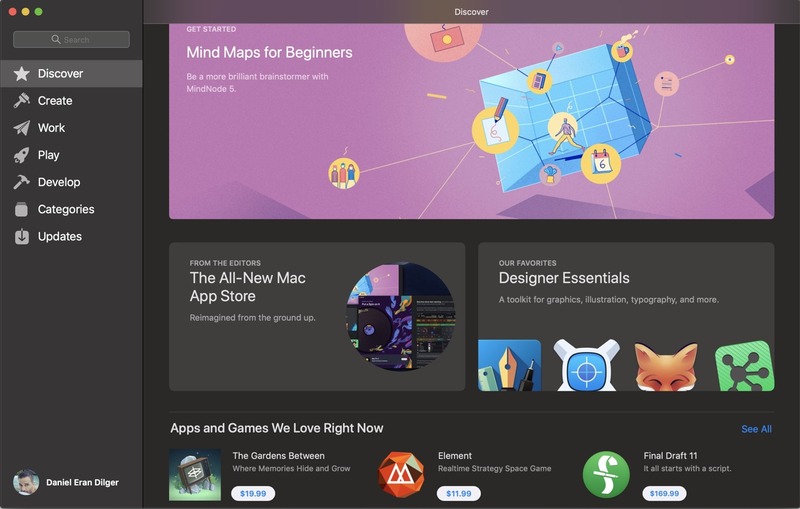 And to get ready for this, Apple is also launching an all new Mac App Store, patterned after the enhancements it made to the iOS App Store last year. These include curated collections of software specific to Creators, Developers, Workers and Gamers, with stories and videos that make it easy to find the software you're looking for. Improved merchandising of apps resulted a solid improvement in iOS app sales, and should also dramatically improve the usefulness of the Mac App Store —as well as get things ready for new UIKit apps arriving next year. 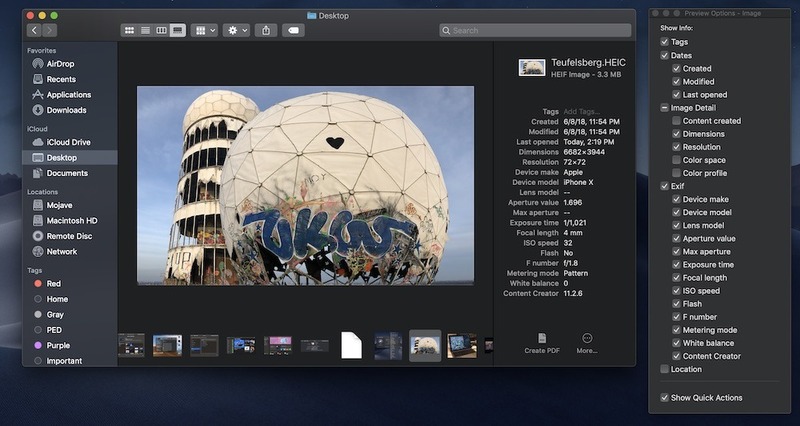 Beyond all of the beta period refinements made in Mojave over the last three months, Apple has also updated its own apps, including Pages, Keynote and Numbers, to support Continuity Camera as well other new Mojave features including Dark Mode. And in parallel, developers have been taking advantage of the beta period to add support for new Mojave features as well. However, as noted earlier, any Mac users who are reliant on specific apps should make a point to follow up with those apps' third party developers to make sure they've worked out any issues with the Mojave release before updating to the new OS. Apple appears to be making fewer drastic changes to macOS as it matures, but even minor changes may cause disruptive issues for apps that aren't ready yet. Just over 34 years after the original Macintosh first shipped in 1984, it's almost hard to believe that Apple's iconic desktop has now been grounded on sophisticated NeXT technologies for more than half of that time. Since the first consumer 10.0 version was first released 17 years ago, Apple has introduced 14 major new updates —compared to just 9 major version numbers across the first 17 years of the Mac's existence under the classic Mac OS system software. After years of radical overhauls that modernized its printing, networking, file system and media handling; made huge shifts to 64-bit and Intel processors; and introduced entirely new capabilities from Time Machine to iCloud integration to Continuity to memory compression —one could say that Apple's macOS platform has now reached a Golden Age. There's still room for improvements, but using a Mac has never been a nicer experience where things generally work so well that little touches often feel delightful. One aspect that is improving —but at an often frustratingly slow pace —is Siri. After brining its voice assistant to the Mac, Siri continues to gain new features, including hands-free "Hey Siri" support on brand new iMac Pro and the latest TouchBar MacBook Pro models. Plus it now has the handy ability to find your AirPods or iOS devices or control HomeKit devices —as well as more questionable abilities to ask about holidays or celebrities or sporting events. However, it still struggles in other areas. Ask it to turn on Dark Mode —a natural expectation on a OS release defined by the new feature —and Siri plays the role of HAL 9000 in 2001. You can, however, quickly switch into Dark Mode using a keyboard shortcut or a new Automator Action installed in the TouchBar with Mojave. Under the hood, Apple is also making significant improvements to macOS, particularly for developers. Xcode 10 received some of the most interest among WWDC developers thinking about Dark Mode, in part because of the natural fit for a dark UI when working with code, and of course because Apple gave its development tools features specific to testing out the new Dark Mode on coders' own apps. Apple has also opened up improved developer access to a technology Apple has been increasingly using internally: Machine Learning. Using the new CreateML, developers can build original ML models that leverage the work Apple has already done in vision and natural language models, creating tools for image classification, word tagging, and sentence classification using training data and a few lines of code. The Mac is no longer the scrappy underdog crying out for attention in a world dominated by Windows PCs or defined by Unix. In fact, as observed in an earlier look at the Mojave Public Beta, Apple isn't really focusing on selling Macs to consumer PC switchers anymore at all. Instead, Apple continues to disrupt the market for PCs by offering competitively priced iPad models that are simpler to individuals use and easier for companies to deploy, with a focus on high mobility rather than seeking to replicate all the functionality of legacy desktops and a windowing environment—much of which is simply unnecessary for users with streamlined needs. The Mac is now being sold as the ideal "creator" computer for iOS users, visible in the range of features Apple has brought "back to the Mac" after initially introducing them on iOS. This continues in Mojave with the adoption of iOS-like screen capture editing which is actually enhanced on the Mac. Then there's the aforementioned Markup document editing and cropping, simple Trim editing on audio and video files, and even entire apps that were formerly exclusive to iOS, including Home (below), News, Stocks, and Voice Memos. Not so many years ago, Apple was clearly working to make the Mac familiar, comfortable and compatible to users of Unix and Windows. Today, Apple is focusing it efforts on making iOS users feel at home on the Mac. It's not hard to understand why. A decade ago, PCs and Unix were dominant computing operating systems. Today, iOS 11 represents the largest, most valuable platform —larger even than Windows 10 and far more valuable than devices running any version of Android. As a premium bank of users, iOS is simply the best demographic Apple can market its Macs to —and those premium buyers with an interest in the newest technology are already inside its stores. One of the unique features Apple sells on iOS is privacy and security —enabling users to decide if they want an app to be able to send notifications, access their camera or use their location. In Mojave, Apple has also brought more of these controls to the Mac, requiring apps to ask for permission to access the camera or microphone, or to read data from Mail or Messages, or backups from Time Machine or iTunes. Apple is also making it easier to use strong passwords, and to find and strengthen weak passwords used across various online accounts —something I've caught myself doing, even after the massive account breaches at Yahoo and Equifax. With iCloud syncing between iOS and Mac Keychains, this makes it even more attractive to iPhone buyers to opt into buying a Mac. Additionally, Siri can now be used to look up passwords without manually navigating through the Keychain app. At the same time, Apple is also working in parallel to make Macs a viable option in the enterprise as an alternative to Windows PCs. Yet even here, the door into corporate deployments was opened by iOS, whose users are the most likely to now request a Mac in the workplace. Still, for switchers Apple has enhanced its Migration Assistant. The tool is now capable of transferring much more information from a Windows PC: documents, contacts, calendar, email, and system accounts can all now be moved in addition to the Desktop and Documents folder it could move in the past. Rather than being overdue for a merger, Apple's iOS and macOS computing platforms have a synergy that is enhanced by staying separate, with each focused on being optimized for the kind of hardware it runs on. At the same time, Apple is also enhancing how well Macs work with iPhone and iPad with its Continuity features. In Mojave, this gets a boost with Continuity Camera, which now works just as effortlessly as using AirDrop to send files or URLs, or copy and paste to send selections back and forth wirelessly. With its distinct iOS mobile offerings, Apple has focused its macOS platform on professional creators and others with a need for more power and complexity in their computing tools. Mac hardware has effectively dropped the low-end entirely to focus on premium models: iMacs with large, high pixel count displays; ultra-thin, performant MacBook notebooks; the beefy new iMac Pro and upcoming new Mac Pro models. Microsoft now supports Windows across everything from low-end 32-bit ARM, Celeron and Sempron chips to high-end Epyc and Xeon processors, and across a range of PC hardware—from limited RAM and minimal SoC GPUs to the other extreme of components. 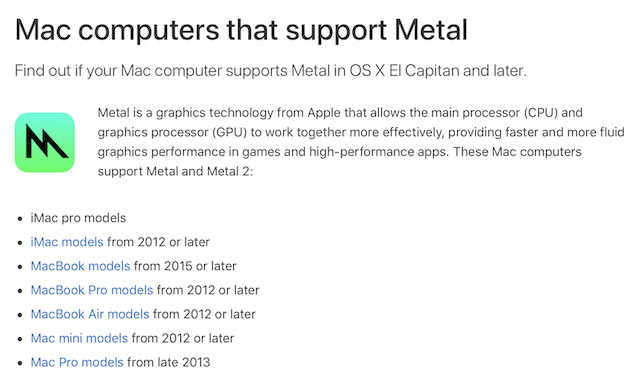 In contrast, Apple's entire Mac range uses mainstream 64-bit Intel processors, roughly consistent supplies of RAM, and —now under Mojave —both supporting Metal-optimized graphics hardware and making it a minimum requirement. This greatly simplifies Apple's development of macOS and enables the company to rapidly introduce new technologies like Metal —the same way that exclusively running iOS on premium devices with consistent hardware specifications makes it much easier to upgrade and improve compared to the fractionalized world of Android, stretched thin across a disparate range of mostly low-end, under-specced devices. Additionally, the fact that macOS is free means that Apple can focus on fixing issues and adding useful new features, rather than trying to shake up interest with coats of frosting and marketing frills to justify an upgrade fee. Apple loses some revenue from giving its OS updates away for free, but also gains some major benefits. First, it dramatically increases adoption of new updates, enabling Apple to rapidly deploy new apps and technologies for third parties to use. Secondly, it greatly increases the ongoing value and lowers the Total Cost of Ownership for Mac buyers. Mac buyers often pay a premium upfront over Windows PC alternatives, but they can also expect to get free, significant annual updates across the next five or so years. Windows hasn't even been updated since version 10 appeared in 2015; new versions before that came out about every three years between Vista, 7 and 8, and these struggled to justify their $120 to $200 upgrade prices by adding flamboyant and often unappreciated features such as the Metro UI and other radical —sometimes arbitrary —shifts that turned off many users. Apple's newest release of macOS Mojave includes a number of major changes that are immediately visible to users. However, rather than just arbitrarily just shifting how things work, the new features overwhelmingly feel like natural improvements that existing users will want to adopt. At as a free upgrade, the majority of users have no reason to hesitate to upgrade. Note that before you update, it's a great idea to back up your Mac first, and also check to see if any important apps you're using have reported any issues with the new software.